Whilst running a guide training course on Onguma Private Game Reserve (eastern border of Etosha Game Reserve, Namibia), we did alot of walking. On one of the morning walks in some beautiful open woodland we found some very active dung beetles. When you think that many people come on safari in the dry season, you realise that they simply miss this major safari attraction – for kids and adults alike. As a guide, you know the dung beetle’s story well and it is easy to stay standing and share your version of the dung beetle story. In this instance, we kneeled down low and really watched what was happening. There was good interaction between the beetles which we could interpret, but after looking long enough we noticed a small ‘fly’ hanging about. On a normal day you might leave it at that, right? But the wonder is in the detail!! I photographed the beetle and managed to get the ‘fly’ in the photo. The challenge for guides is to take on the challenge of the situation and not to be scared of saying “I don’t know”. Only then will your daily guiding become truly interesting. When we got back to camp, we opened the books and started looking. It took a while, but eventually we got the page on wasps and there it was! A Typhiid Wasp that parasitises the larvae of various beetles esp. 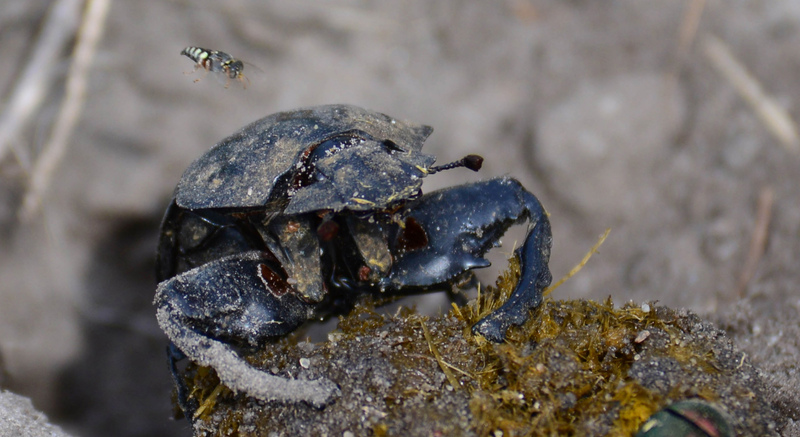 dung beetles that bury their balls underground! What a pleasure to make this discovery. We agreed that if this happened with our guests, there would be no shame in acknowledging a gap in our knowledge, but rather celebrating a great discovery that we could share with them.